Horizon Nuclear Power announced today that it will suspend its UK development programme for new nuclear power stations, following a decision taken by its parent company Hitachi. Horizon is developing the Wylfa Newydd nuclear plant on Anglesey in North Wales and has a second site at Oldbury on Severn in South Gloucestershire. Hitachi has said it would post an estimated 300 billion yen (£2.14 billion) impairment loss as a result, plus 300 billion yen in other related losses. Speaking in the House of Commons today, Greg Clarke highlighted that Wylfa Newydd is “suspended” rather than cancelled, as the Government and the company will now engage on whether the project can be taken forward by looking at a different financing model. However, he also indicated that the Government had already made its best offer in terms of financial support and subsidy for the project, and that the falling costs of renewables were making the economics of nuclear more challenging. “Firstly, the Government was willing to consider taking a one third equity stake in the project, alongside investment from Hitachi and Government of Japan agencies and other strategic partners. Secondly, the Government was willing to consider providing all of the required debt financing to complete construction. Thirdly, the Government agreed to consider providing a Contract for Difference to the project with a strike price expected to be no more £75 per megawatt hour. The Government will now be exploring other approaches, including the viability of a Regulated Asset Base model for nuclear projects – an update on this is promised this summer at the latest. This news, following on from the cancellation of the Moorside project that was abandoned by Toshiba in November, means the government faces a supply shortfall in the late 2020s and early 2030s – together the three power stations would have supplied around 15% of GB electricity demand. BEIS has said, in response to today’s announcement, that there will be no implications to security of energy supply, however with the exit of coal and the growth in demand driven by electric vehicles, the Government will need to look hard at how long-term demand will be met. Any de-carbonisation of heat over this period would widen the potential supply gap. Several MPs called in to question the lack of support for the Swansea Lagoon project, but Greg Clarke pointed out, rightly, that the tidal lagoon proposal would have delivered a significantly smaller output at significantly higher cost. There difficulties faced by new nuclear projects does not mean that un-economic renewables schemes should be re-visited, and the Government was correct to rule out the Swansea project. In the Q&A after his statement, Greg Clarke re-iterated the desirability of a diverse energy mix, including nuclear, and re-stated the Government’s commitment to the new EPR at Sizewell C. It is unfortunate that one again the Government is faced with an EPR-or-nothing choice, given the many serious problems with the technology. Despite the funding issues at Wylfa Newydd, the details of which are not public, it is not clear that EPR is a superior approach to the ABWR, which has a proven track record and has in the past been delivered on time and on budget. Small Modular Reactors (“SMR”) also featured significantly in the Parliamentary session today, with the Government considering a collaboration with Rolls Royce that would involve a “significant joint investment”. In November, the Government announced £32 million of funding for SMR testing, while in the US, the Nuclear Regulatory Commission granted phase I approval for the technology back in May 2018. SMRs are already being built in China and Russia. Whichever technology route the Government supports, any discussion of future supply should take into account the variability of that supply. Greg Clarke and others in today’s debate highlighted the falling costs of renewable energy, however project costs ignore the costs of integrating intermittent generation which are fully borne by consumers through increased network costs and higher system balancing costs. In his review of energy markets, Dieter Helm said that “polluter pays” was less desirable than “intermittency creator pays” and that the creators of intermittency should pay for the costs they impose on the system. This would radically change the economic balance between new nuclear and renewables. Large-scale new nuclear operating primarily in baseload format will impose few new costs to the wider electricity system since the system was designed to accommodate such large units of generation. If renewables projects bore the system costs they imposed, there would be a more level playing field between the technologies, and the economics of new nuclear could well become more attractive. Exploring a regulated asset model for new nuclear is also sensible, reflecting the sheer scale of the investment required for new large nuclear plant, which is now all but out of reach for any individual commercial entity (EDF, being 84% owned by the French state is arguably not a typical commercial entity). It would be a good outcome if today’s news on Wylfa (and Oldbury) led to a more equitable and cost-reflective analysis of new energy projects, however, despite the clear recommendation in the Helm Review (which was commissioned by the Government), such a move would be politically challenging and it seems unlikely, against the current political backdrop, that the Government would attempt something so radical. ← What next for energy markets in 2019? The idea that the “intermittency creator pays” for the cost of the intermittency would seem logical providing this were applied blindly throughout the system e.g. on both generators and electricity consumers. If the assumption is that the “best” electricity system is one that is operating completely constantly, then by extension, any actor on the system that creates a disruption could be charged by the magnitude of their disruption. Perhaps in this world, the act of switching on your oven would cost more than actually running it. Designers might race to develop appliances that gradually ramp up and ramp down their electricity demand smoothly to avoid these ‘disruption’ costs. However, I wonder if this isn’t distracting from a more important conversation. If one’s definition of “best” is undertaken holistically from the nation’s perspective and considers factors beyond cost such as: resilience, reliability, ecological effects, geopolitical effects, balance of trade, employment, risk, liabilities, operational simplicity, etc. then one might decide that intermittency is a less strategic driver. Is there not a strategic risk to Germany if it simply replaces its dirty generators with ‘clean’ and ‘cheap’ pipeline gas supplied from/through Russia, especially if it’s already heavily dependent on Russian gas? How can Germany put a value on this political risk and how much therefore should it be prepared to pay to avoid it? Similarly, if the UK increases its dependence on LNG supplied through the Malacca or Hormuz straits, what could energy prices look like if Trump picks a fight with Iran? Technological progress is constantly evolving both generation and consumption, so why not explicitly recognise that the electricity grid is a legacy asset constructed over a very long timeframe during which the world has significantly changed and will continue to change. Would it not be in the national interest to undertake a national strategic review that holistically considers where the nation wants to aim for, what we have now, and this then is used to set the direction? Feels to me that excessive focus has been placed on ‘cost’ (politically popular) and not enough on ‘strategic value’ (hard to define and politically worthless). In my opinion, the electricity ecosystem, if managed strategically, has the ability to deliver more value to the nation; discussing who pays for intermittency seems to distract from a more important, urgent and overdue strategic conversation. Hi there – sorry it’s taken me a while to reply…it’s hectic at the moment! What you’re saying is interesting and not something anyone seems to be focusing on. I agree that energy infrastructure (both physical assets and the policy/market frameworks) should be seen as a strategic asset that should be both optimised and protected. In addition to geopolitical threats there are also cyber threats creating a rush to patch up systems that were never designed to be hack-proof. Unfortunately I can’t see any Government, even one not distracted by Brexit, taking the initiative on this, and policy will continue to limp along, tinkering at the edges while talking up remote prosepcts such as CCS and hydrogen gas networks. I also wonder whether looking at the electricity system more strategically might make it more expensive since the questions you pose could lead to a more defensive stance on security of supply questions…things like gas storage assets, which are not economic without being assigned a social value paid for through subsidy. On your other point about the creators of intermittency…while it’s true the demand side is responsible for intermittency, the system was designed to accommodate this. Of course, if transport and heat are electrified, demand will rise, and swings in demand will probably be higher, however, time-of-use pricing can be used to assign costs to these different usage patterns. While the costs of intermittent demand are likely to be passed on the consumers, given the current direction of travel of energy pricing, this is not the case for the suply side of the equation. The electricity system was not designed to accommodate intermittent generation – it was designed for baseload, and dispatchable peaking plant. It might be that the work Ofgem has asked National Grid to do on BSUoS helps to level this playing field if a way can be found to make charging for balancing the system more cost-reflective. You can see that wind and solar made no meaningful contribution at all, while CCGT stations provided the flexibility in the system. Multiplying the amount of wind and solar isn’t going to solve this, and in any case we are already at the point where there is curtailment of surpluses when the wind does blow or the sun does shine. In reality, there has to be almost complete backup from reliable generation sources: battery storage is not an answer (it is used in small volumes mainly to help balance very short term fluctuations in the supply/demand balance while the beefier generators catch up, which can take some seconds). You will note that the chart shows pumped hydro being used to help meet peak demand – but its contribution is limited: we just don’t have the sites to install facilities to meet demand on a cold windless winter day – let alone to provide the storage needed to cover for prolonged spells of weather with limited generation, or to smooth out the average seasonal fluctuations. As the proportion of wind and solar increases, intermittency comes to dominate the issues – both in terms of generation, and of transmission capacity, since alternative generation capacity will not be sited in the middle of the North Sea or on top of Scottish mountains for hopefully obvious reasons. Costs escalate alarmingly as we attempt to pretend that we are helping the climate. 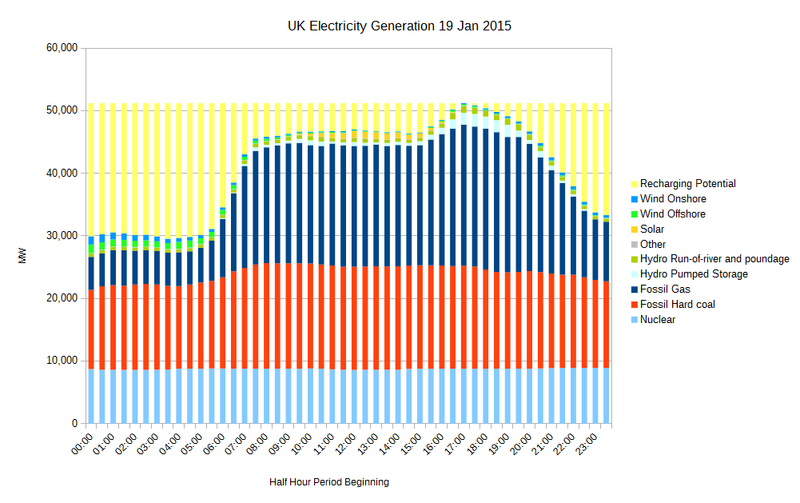 Here is the picture for a highly simplified grid based on hourly data over a year, consisting of just wind and CCGT. The amount of CCGT required is constant, because there is a requirement to meet demand on a “zero wind” day. However, its utilisation falls if wind is granted grid priority. Meanwhile, even if we assume we can stabilise the grid running on very high levels of wind, we find that curtailment of surplus wind escalates sharply as capacity increases. 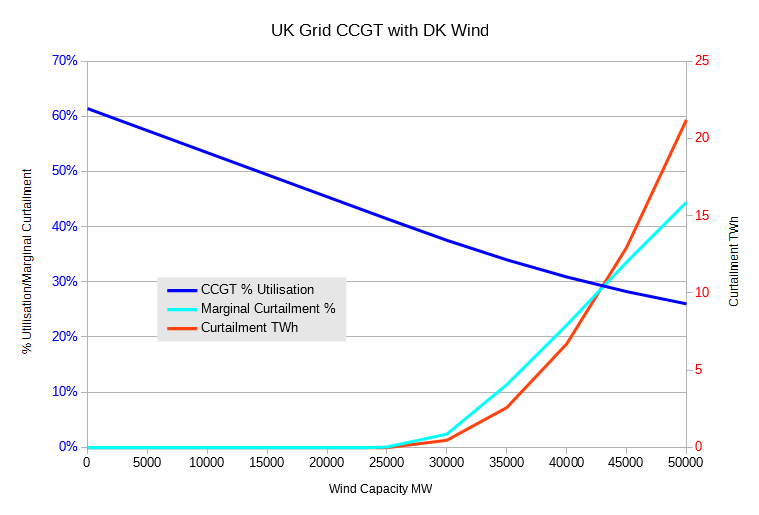 If you have to throw away half the output of a marginal wind farm it doubles its cost. The chart takes us only about as far as 50% average wind share of demand – you have to allow for the capacity factor of the wind farms. These problems aren’t really solved by building lots of interconnectors to other countries that are also trying to maximise renewables output, because weather systems can cover pretty much the whole of Europe. The interconnectors do ensure that such supply as is available goes to the highest bidder, ensuring uniformly high prices during shortages. Your points about strategic supply should be taken into account. A sensible system doesn’t put its eggs in one basket. But the strategic issues apply to all sources of generation: wind and solar increase our dependence on China, as the chief supplier of solar panels, and of neodymium – essential to making small high power magnets require generators atop a wind turbine. For now, most of our gas imports come from Norway – and we may have the potential to produce our own in quantities sufficient to meet our needs for 50 years just from Bowland shale. LNG is available from an ever increasing list of sources, and is internationally traded. The LNG market has seen two demand shocks in recent years: Fukushima, which caused Japan to switch to LNG from nuclear, and the more recent upsurge in demand from China outpacing new production. However, gas (and oil) prices remain well below those forecast by DECC a few years ago – it failed to consider a range of scenarios, as politicians insisted on supporting their green vision: this is what needs to change across the whole raft of energy policy if costs are to be lowered. Coal pricing is only weakly linked to gas pricing, and so can offer a means to spread risk. Our main problem with nuclear is over-regulation (a secondary problem is that nuclear works best when used as base load, since fuel costs are minimal, while most of the cost is the original plant and decommissioning cost, and the plant itself works best in stable operation). France built their fleet of nuclear power stations in the 1970s and early 1980s at low cost before over-regulation that drives up costs became fashionable in the West, producing consistently cheap power. It is strange that now they seek to abandon it in favour of wind and solar.